After acquiring 10 per cent stake in Bangalore-based Timbre Media Pvt. Ltd, RPG's music label Saregama India Ltd has just announced plans to launch Worldspace stations Farishta, Jhankaar, Gandharv and Shruti on digital platforms. Founded in 2010 by executives of satellite radio firm Worldspace Inc, which shut down after going bankrupt in India, Timbre Media has drawn up plans to re-launch WorldSpace stations on mobile, Internet and DTH services. Timbre appears to have an non-exclusive agreement with Saregama to use its music content as well as partner with other music labels. It will provide 24-hour stations of Indian music ranging from old hindi films, Hindustani classical, Carnatic classical, new hindi music, ghazals and stations in other Indian languages. 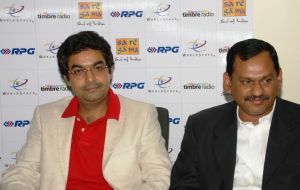 Timbre Media has set up new studio facilities in Mumbai and Bangalore where it will package and distribute music content. Seetal R. Iyer, Co-Founder and Head of Content, Timbre Media said, "We focused on returning those lost stations of WORLDSPACE to the people. For our listeners, this means that their favourite WORLDSPACE stations like Farishta, Jhankaar, Gandharv, and Shruti, to name a few, will be back again soon on various platforms." This alliance is in line with Saregama's increased focus on the digital domain. Adarsh Gupta, Business Head â€“ Music at Saregama India said "This is a very logical alliance for Saregama as it takes us to the next stage in the value chain with our content. We believe that there is still a very loyal customer base that appreciates the quality that the Timbre team provided previously on WORLDSPACE. Through this alliance we will endeavour to bring the same quality and serve this product in all possible digital formats including Mobile, DTH and the internet."